Goldsmid and Gordine may sound like a firm of solicitors, estate agents or jewellers but in fact, they are the surnames of the creators of the latest sets of Personal Papers whose catalogues are now available on Archives Hub. The Papers of Frederic John Goldsmid have been organised and catalogued by one of our volunteers, Ali Ahsan. He will be blogging about his experience, in the coming weeks, of working with the Papers of both Goldsmid and William Pettigrew. So I won’t anticipate that post by writing about Goldsmid in this blog, other than to say that the catalogue for his Papers can be found here. Dora Gordine was born in Latvia, which at that time was a province within the Russian Empire, to Jewish parents. Her exact date of birth she took care to keep secret and cultivated a mystique about her past. She grew up in Estonia where she trained as a sculptor, and lived both in Paris (1924-1929) and South-East Asia (1930-1935) before settling in London in the 1930s. In November 1936 she married the Hon. Richard Gilbert Hare (5 September 1907 – 1966), son of Richard Granville Hare, 4th Earl of Listowel, and Freda Vanden-Bempde-Johnstone. They created and lived at Dorich House, London. She also created studio houses in Paris, Singapore, and Highgate, London. During her time in Asia, she met Richard Winstedt who was then a colonial administrator in the Malay Civil Service. Their friendship continued when they both returned to England and at some point, probably between 1943-44, Winstedt sat for her. The bronze head that Gordine sculpted from these sittings is now part of the RAS Collections. 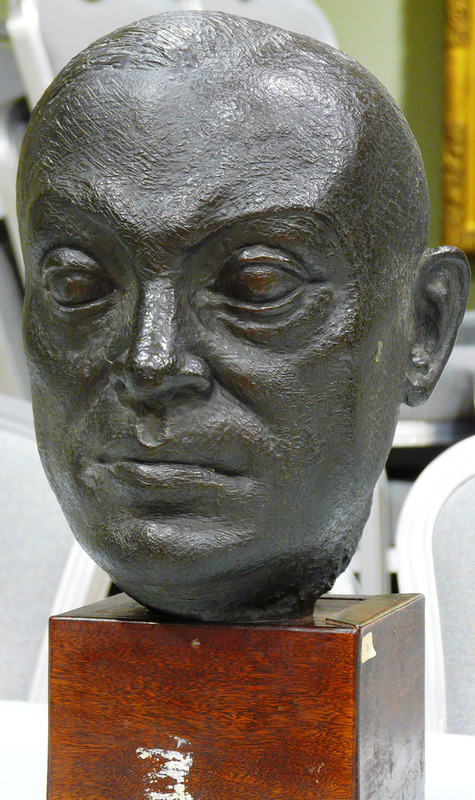 This bronze with black patina was first exhibited at the Royal Academy , London, in May 1944 and the Daily Telegraph remarked that Gordine’s head of Winstedt effectively “brought out the geniality of this very erudite Malayan scholar”. The circumstances of the acquisition of the sculpture by the RAS are currently unknown, but hopefully as more of the institutional archives are sorted this will come to light. It has been suggested that Gordine’s career as a sculptor was adversely affected by the outbreak of the Second World War due to the shortage of raw materials with which she could work. Richard Winstedt, by then Director of the Royal Asiatic Society, asked her to lecture to the Society between 1940 and 1944 on Asian Sculptures. These lectures were subsequently published in the Journal of the Royal Asiatic Society. Her 1940 lecture was published in 1941 under the title of “The Beauty of Indian Sculptures” in which she opens with “My appreciation of Indian sculpture is not that of an art historian but of a living sculptor”. Gordine continues to encourage her listeners/readers to regard items from an unfamiliar civilization, not just for scholarly dissection, but for joyful appreciation by all lovers of beauty. I don’t know if such a statement would have endeared her to the Fellows of the Royal Asiatic Society at that time, but it is a motif that we are currently trying to incorporate alongside enabling our Collections to be accessed for “scholarly dissection”. The use of the material on the Twitter feed and Facebook posts, in creative writing workshops and other events, enables many to access the beauty and intrigue of the delights in our Collections. Gordine continues in this lecture to suggest that in Indian sculpture there is an ease of expression of the human form, and contrasts this with the cold ideal of Greek sculpture, or the suppression of the body to impress the mind of medieval Christian sculpture. She suggests that “The constant sight of beautiful naked bodies, standing in natural poses or moving to the rhythms of a dance, must have made such an interpretation of the human form easier for Indians than it is for us.” She stresses vigour and voluptuousness as characteristics of Indian sculpture. It would have been interesting to hear the discussion after this lecture. We have only a handful of items related to Gordine within her personal papers – an issue of Ars Asiatica with Richard Hare’s name and address on the frontispiece; a photograph of her sculpture of a Malay head, currently housed at the Town Hall, Singapore; some notes on a sheet of paper marked “Slides, Ars Asiatica”, with plate details in the same hand; a loose plate with photograph of “Buddha from Pangkalan, Ipoh, Perak”; and a receipt from Lloyds Bank to Hon. Mrs. D.G. Hare. It is unknown how these items came to be part of the Collections – possibly they were left when she was undertaking her lectures with the Society. 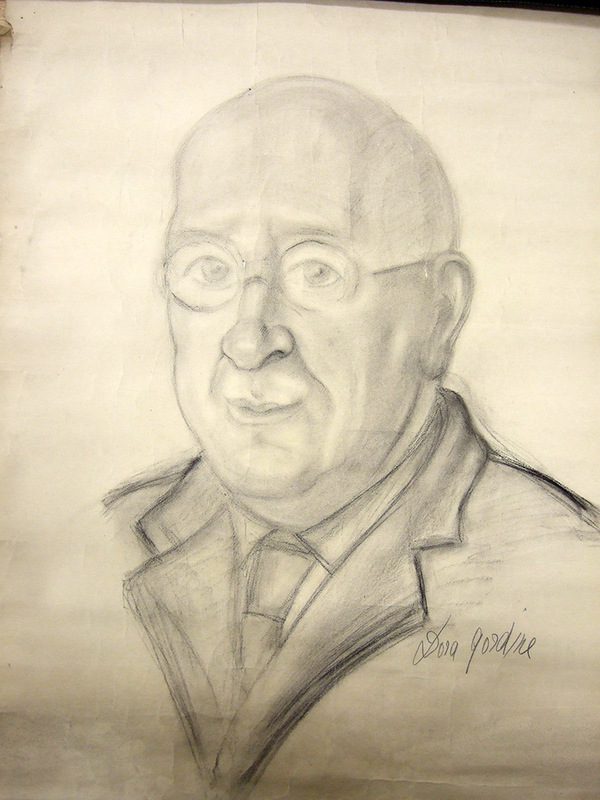 During the 1940s/50s Gordine’s work was exhibited regularly at the Royal Academy, the Society of Portrait Sculptors, and elsewhere. Bronzes from this time have ironic or humorous titles, relating to the pose, such as ‘Great Expectations’ or ‘Mischief’ and, of an RAF Officer, ‘Above Cloud’. She was elected a Fellow of the Royal British Society of Sculptors in 1949. In 1948 she was commissioned to produce a sculpture to stand in the new mother and baby unit at Holloway Prison in north London. Her husband, Richard Hare died suddenly of a heart attack in 1966. Gordine continued to live and work at Dorich House.